NTPC Ltd reported a marginal fall in September-quarter profit on Friday, missing estimates, as higher expenses weighed. Profit came in at Rs 2,426 crore for the three months ended 30 September, compared with Rs 2,439 crore a year earlier. Shares traded 0.7% up at Rs 157.90 per share. Shares of PUS banks declined after Punjab National Bank a loss of Rs 4,532 crore in the quarter ended September due to substantial increase in provisions for bad debts, as against a loss of Rs 940 crore in the previous quarter and a profit of Rs 560 crore in the year-ago period. PNB shares fell as much as 8% to Rs 68.15 per share. Hindalco Industries Ltd posted a 21.4% decline in September-quarter net profit, dragged down by rising input costs, but marginally beat estimate. Standalone profit after tax came in at Rs 309 crore in the second quarter, compared with Rs 393 crore a year earlier, Hindalco said. Eleven analysts on an average had expected the company to report a profit of Rs 307 crore, according to Refinitiv data. Revenue from operations for the company rose about 5% to Rs 10,833 crore. Hindalco shares jumped as much as 5.7% to Rs 244.20 per share. 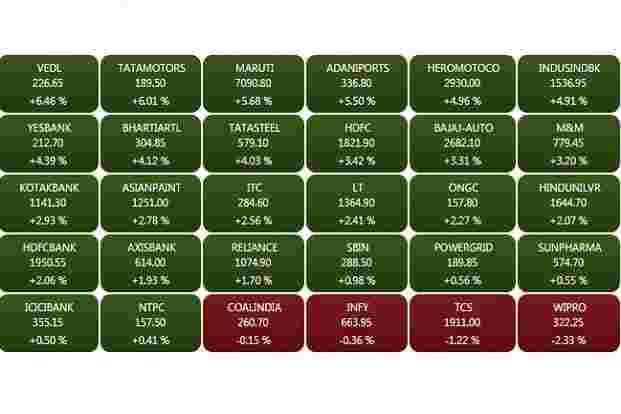 The BSE Sensex rose 693.79 points, or 2.01%, to 35,125.76, while the Nifty 50 gained 205.30 points, or 1.98%, to 10,585.75. 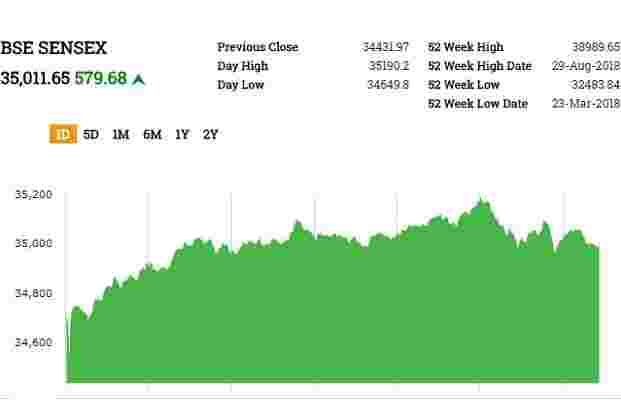 Intraday, the Sensex surged 698.57 points to 35,130.54, and the Nifty 50 soared 212.2 points to 10,592.65.The BSE MidCap and SmallCap indices advanced 1.81% and 1.64%, respectively. All the sectoral indices on BSE traded higher with auto gaining most at 4.46% followed by metal and basic materials, which rose over 3%. Shares of Maruti Suzuki India traded 5.35% up at Rs 7068.25 per share. The stock surged as much as 5.57% intraday to Rs 7,083.70 per share. India’s largest passenger carmaker on Thursday reported a marginal drop in domestic sales of passenger cars in October to 122,280 units, against 122,459 a year ago. These figures do not include sales of commercial vehicles and vans. The compact segment comprising Baleno, Swift and Ignis hatchbacks clocked sales of 64,789 units, posting the highest rise of 3.7% over the year ago, among other categories. According to Kotak Institutional Equities, demand and customer footfalls have started to improve in the passenger vehicle segment, and it will have positive impact on Maruti. Dilip Buildcon Ltd said that it has executed a contract agreement with Madhya Pradesh Metro Rail Co. Ltd for metro rail projects in the state. Shares traded 1.57% up at Rs 443 per share. PC Jeweller shares surged as much as 16.9% to Rs 81.35 per share on high volume. 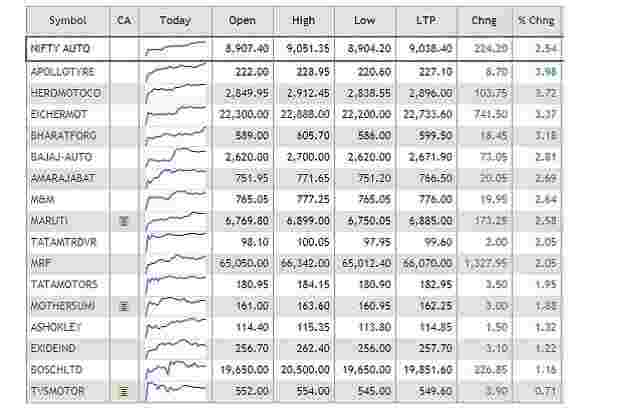 Around 30.13 lakh shares changed hands on BSE, compared to 2-week average of 17.66 lakh shares. Marico shares jumped as much as 5.13% to Rs 336.75 per share. The company reported a 17.95% increase in consolidated net profit at Rs 218.26 crore for the second quarter ended September, compared to Rs 185.04 crore in the year-ago period. Revenue from operations in the quarter stood at Rs 1,836.82 crore, compared with Rs 1,536.29 crore in the same period last year. Larsen and Toubro said its construction unit has received orders worth Rs 1,329 crore. LT shares traded 1.42% up at Rs 1,351.75 per share. Shares of auto companies traded higher over positive October vehicle sales data. India’s top five carmakers—Maruti Suzuki India, Hyundai Motor India, Mahindra and Mahindra, Tata Motors and Honda Cars India—together sold 230,870 vehicles last month, a 2.06% rise from a year earlier. The Nifty Auto index was up 2.5% led by Hero MotoCorp and Eicher Motors. 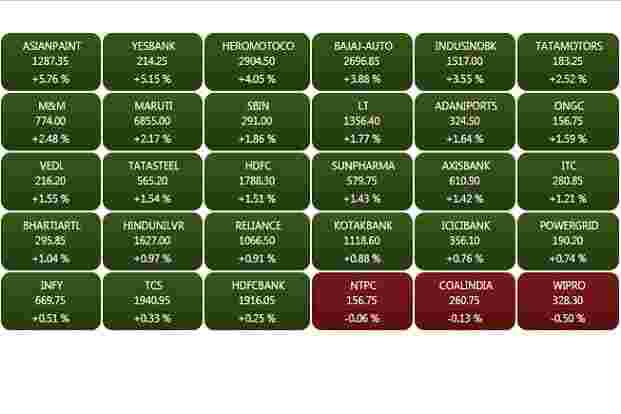 The BSE Sensex rose 398.44 points, or 1.16%, to 34,830.41, while the Nifty 50 gained 117.35 points, or 1.13%, to 10,497.80. 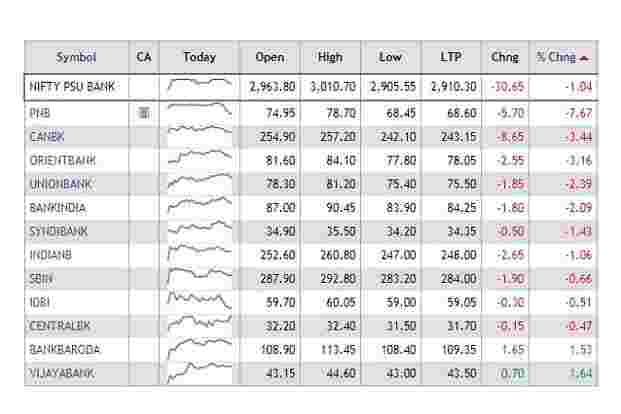 The BSE MidCap and SmallCap indices surged 1.49% and 1.34%, respectively.All the sectoral indices on BSE traded in green with auto and consumer discretionary goods rising over 2%. Oil and gas, realty, industrials, consumer durables and bankex rose over 1.5%. Shares of oil marketing companies were trading higher after crude oil prices fell below $73 bbl mark. Bharat Petroleum Corp Ltd rose 4.2%, Hindustan Petroleum Corp Ltd 2.2% Indian Oil Corp Ltd 3.2%.